I've just recently begun reading a book that's been in my to-read pile for quite some time now: The Case for Books: Past, Present, and Future by Robert Darnton. I picked up my copy at a library sale, which I found somewhat ironic. If I were a librarian, I believe I'd keep it on the shelves, just for the sake of the title. 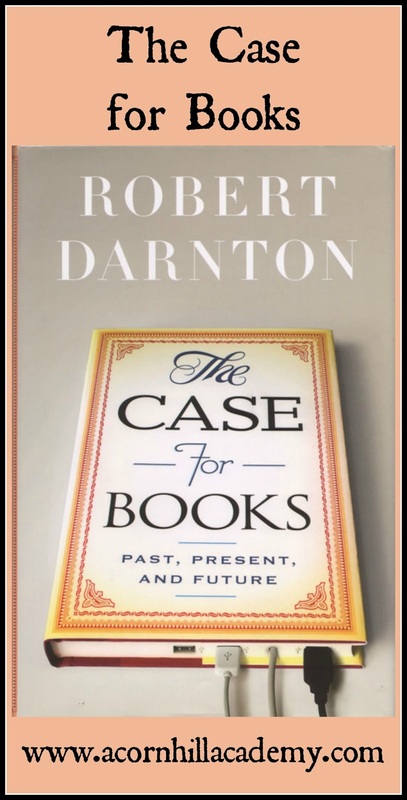 Robert Darnton comes to the discussion of books, in their various forms, with a unique and broad perspective. You can check out his website here. He is an author (obviously), a scholar, and a librarian, having retired from being the head librarian at Harvard University. I can't imagine that as anything but a dream job - how about you? He's also worked in the book publishing business. He's been the driving force behind projects aimed to digitize and make available otherwise hard-to-access texts, such as Electronic Enlightenment (edited correspondence from the 17th-19th centuries, available by subscription) and Gutenberg-e (which began as a subscription site and is now open access, offering monographs). The staying power of the old-fashioned codes illustrates a general principle in the history of communication: one medium does not displace another, at least in the short run. Manuscript publishing flourished long after Gutenberg's invention; newspapers did not wipe out the printed book; the radio did not replace the newspaper; television did not destroy the radio;l and the Internet did not make viewers abandon their television sets. Does technological change therefore offer a reassuring message about the continuity, despite the proliferation of new inventions? No. The explosion of electronic modes of communication is as revolutionary as the invention of printing with moveable type, and we are having as much difficulty in assimilating it as readers did in the fifteenth century, when they confronted printed texts. Isn't it interesting to note that people struggled to accept books when they were first printed? In my mind, the invention of the printing press seems nothing short of a miracle, but we are so often unable to embrace change. There is a lot written on e-books, both pro and con. I, myself, prefer a printed book, because I find I learn better when I read in that format. I can read "fluff" on my iPad, but not anything I want to remember. I hear from many people, though, who love their e-readers, and think it's nothing short of miraculous that they can carry an entire library in their pocket. All that to say, I'm enjoying reading Darnton's essays about books. His writing is engaging, rather than simply scholarly-dry, and I'm learning a LOT of new words. There aren't many books that require me to bring out my dictionary, and I'm rather enjoying it. There is much food for thought here about where books have come from and where they are going. The nice thing about an e-reader is that when you encounter a new word, all you have to do is click on it and you immediately see the definition. But, I agree, hard copies are my favorite. Now off to find Darnton's book at my library. Sounds fascinating! That really is interesting to consider that books themselves originally posed an issue. I still need to physically turn the pages!